Cleveland-Cliffs isn't the company it once was, but Wall Street is still pricing it that way. 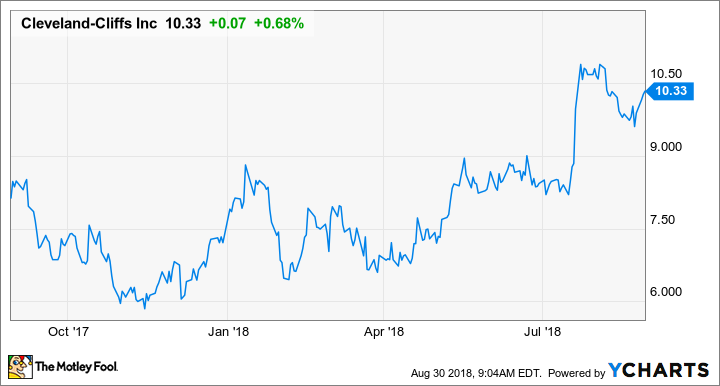 For years, iron ore producer Cleveland-Cliffs (NYSE:CLF) has been in the midst of a turnaround plan that has completely transformed the company from a debt-laden business suffering from di-worsification to a much leaner miner focused solely on serving North American steel mills. At times, it looked like a company on the brink of bankruptcy, but those days are behind it, as it has produced some impressive earnings results lately. Despite the fact that Cleveland-Cliffs is nowhere near the company it once was, Wall Street seems to be pricing this stock as if it is headed for another downturn. Based on management's outlook for the next couple of years, that doesn't seem to be the case. Here are a few quotes from the company's most recent conference call that show why this is a different business and why investors should seriously consider this stock today. Earlier this year, Cleveland-Cliffs' management announced it was ending its operations in Australia, as they were no longer economical. The iron ore quality coming from its mining complex wasn't great, the strip ratio -- the amount of raw earth they have to dig up to get a ton of iron ore -- was deteriorating, and the price for lower-grade ore was falling through the floor in China. Wrapping up operations at any mining complex is typically expensive, since there are reclamation and environmental mediation costs that can run in the hundreds of millions of dollars. Fortunately, though, management was able to find a buyer for the facility, which means it will turn a drawn-out process into a quick return. Here's CEO Lourenco Goncalves giving some of the details of the deal. After four years of successful asset divestitures, including all five coal mines, Wabush, Blue Lake, chromite, nickel and all other smaller projects. The sale of APIO [Asia Pacific Iron Ore] was the final piece of our strategy-driven transformation. We have said from the beginning that our objectives are [a] clean exit from Australia with minimization of liabilities. This transaction allows us to accomplish both. We not only reduced our expected cash obligations by $70 million but we also reduced the asset retirement obligations by another $15 million. The divestiture eliminated some of the uncertainty surrounding these obligations and gave us cash in the door from the equipment sales right away. According to CFO Tim Flanagan, repatriating cash from Australia and the closure of the sale will be a one-time $200 million gain next quarter, which will likely get plowed back into the company's other investments. The past two quarters have been exceptionally good for Cleveland-Cliffs. Thanks to management's efforts to clean up the balance sheet and cut operating costs, the company has been posting much-improved net income results in recent quarters. According to Goncalves, we should expect these outstanding results to continue for some time. [B]ecause of how we have constructed our contracts, we have benefited directly and immediately from the rise in bench market steel prices that we have seen this year. I can actually make the case that Cliffs benefits from this steel price rise more and more immediately than most domestic steelmakers and service centers. Based on the role we play in this industry and the ongoing dialogue we have with downstream steel manufacturers, I can tell you that the current strength in the market is not a one-time thing; manufacturing in the United States is back; tax reform is driving industry resurgence; and the base case scenario for steel pricing must be rerated much higher than what we have seen so far, because demand for pellets continues to increase. As we did last quarter, we once again increased our sales volume forecast and now expect to sell 21 million long tons of pellets this year. What's even more important than growing volume is that the company is getting great returns on those sales. EBITDA margins in the prior quarter were 45%, and management expects similar levels of profitability at least through the end of the year. For some time, Cleveland-Cliffs has been touting the benefits of the new hot briquetted iron (HBI) facility it is building in Toledo, Ohio. Each quarter, the company has given a little bit more information about the project and the potential it has to transform Cleveland-Cliffs. This past quarter, Goncalves really got into the nitty-gritty as to why it is a necessary step for the company to take and the economic benefit it will deliver. In the EAF [electric arc furnace] space, we are seeing a migration to higher-quality HBI-like feedstock similar to what we have seen with blast furnace toward higher grade sinter feed ore and the ore pellets. The markets for pig iron and buchling scrap continue to be healthy. With the market share of EAFs in the United States now approaching 70% of the overall steelmaking production and with their further advancement into higher-margin sophisticated steel grades our HBI will be essential. Not to mention the source of our units at Great Lakes EAFs are currently forced to rely upon from places like Russia, Ukraine, Brazil, and Venezuela, are all undependable not caution made like ours will be and cost up to $75 per metric ton, just to transport to the point of use. All of this considered, HBI is an overwhelmingly accretive opportunity for us, in both good and bad markets. First, we'll have a major margin contribution from HBI. With where pig iron and buchling prices are, both above $400 [per ton] and with the benefit of cheap and easily available natural gas, our cash margin for HBI would be north of $150 per ton. Doing a little extra math, the HBI facility is expected to deliver 1.6 million tons per year of HBI. So, if fully utilized, we're looking at a plant that will generate a total cash margin of $240 million annually. Just for reference, management expects 2018 EBITDA around $800 million. While cash margin and EBITDA aren't an apples-to-apples comparison, it gives you a rough picture of how much this project will move the needle for the company. This project may be the first of multiple HBI plants for the company, too. At the Steel Success Strategies XXXIII conference back in July, Goncalves said that total demand for HBI in the Midwest is around 3.5 million tons. With such a high transportation cost for pig iron and HBI imports, it would not be shocking to hear Cleveland-Cliffs announce a new HBI facility in the next couple of years. I don't like going out on a limb too much when it comes to stocks in cyclical industries, especially ones like iron ore in which China plays such an outsized role in the supply-and-demand dynamic. Even with that in mind, it just seems as though the market is wildly undervaluing Cleveland-Cliffs' stock today. The combination of lucrative supply contracts in place over the next couple of years, a much stronger balance sheet, and the added benefit of the HBI facility going live in 2020 should lead to even better quarters than this past one. Management has indicated that demand is growing, and there are further opportunities down the road to grow the business through greater investment in HBI and supplying the U.S. market with higher-grade feedstock necessary for electric arc furnaces. I will concede that the U.S. steel market and Cleveland-Cliffs by proxy are riding a bit of a sugar high from steel tariffs. If those were to go away, then we could see lower prices and imports taking back some market share. That said, cheaper energy costs in the U.S. from natural gas are a structural advantage for energy-intensive industries these days that investors shouldn't overlook. Even after a couple quarters in which Cleveland-Cliffs has shown flashes of what it could be, shares are still trading for seven times trailing earnings. Cleveland-Cliffs looks absurdly cheap, and investors should look really hard at this stock.